Thanks, and remember to VOTE on November 8th, or before! Trump, who needs no introduction, has persevered till now against all Republican presidential candidates and beyond virtually everyone’s expectations of his seemingly Charmin-thick bloviation as a politician of substance, a potential statesman. We all know he’s a master performer, for at least an adoring 35 per cent of the angry, mostly white-male Republican base. Their frustrated fury – precipitated in economic fact largely by the Republican legislature’s stultifying obstructionist politics-as-usual – after the GOP-sponsored Great Recession, is understandable. But it’s also misdirected and rides on “magical thinking,” as Joan Didion called her own extended self-delusion. Trump understands them too, like a snake oil salesman understands a vulnerable, needy family whose house he’s slithered into and fully sized-up for the kill. In normal times, Trump’s campaign would have been killed, skinned, hung and deydrating into dried fruit, many times over by now, because it rarely had more substance than sweet and excessively fresh fruit – invigorating as it can be, at first – that soon turned over-ripe, usually as soon as he tweeted about it. Pardon the unvarnished Heartland metaphor, but it seems apt. 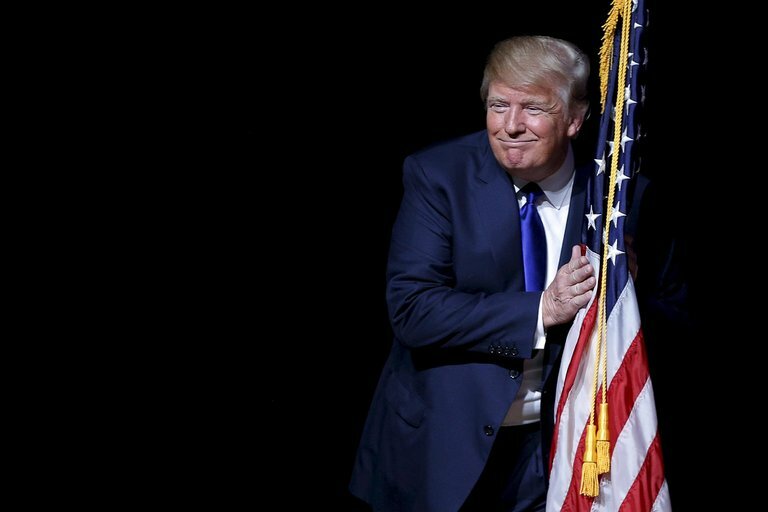 “Trump the Stump,” supposedly on the campaign stump, but actually pretending the flag is a woman. For me, the worthy mainstream is MSCNBC, CNN, PBS Newshour, TIME Magazine, The Atlantic, The Huffington Post and yes, The New York Times and Washington Post. Yes, most of their working reporters are liberals, but they know how to, and exercise, fair journalism by and large, given their biases. And there’s plenty of of good independent media reporting, such as the progressive Laura Flanders Show. I’d include The Wall Street Journal, The Milwaukee-Journal Sentinel – a three-time Pulitzer Prize winner in recent times – and The Chicago Tribune in the list of reliable mainstream, even though clearly they lean to the right editorially. Even Fox News has a few good moments, like when Charles Krauthammer opines, despite his stuffiness. And yes, I’m a liberal, but historically-informed Republican strategist Steve Schmidt, on MSNBC, is one of my very favorite commentators. He’d make a hell of a good candidate in the comparatively noble Grand Old Party of Lincoln-to-Eisenhower. As a career print and radio-media professional, I’m clearly not voting for Trump (as the satirical drawing above I drew of him would suggest) and in my blog I admit bias as its a opinion forum and cultural features-and-criticism site, and in reporting I always strive for fairness. Back to Trump. In a nation where everyone is constitutionally innocent until proven guilty, the arrest of a single previously-reported illegal immigrant and alleged murderer, is the new wobbly top-stone of his “gravitas,” the the WND editors judge. Time and again, Trump sows xenophobia, irrational fear and racism in the public consciousness, with Trumped-up rhetoric and demagoguery. Yet facts, and illustrative, rationally meaningful statistics — which Democratic candidate Bernie Sanders showed a surpassing command of — mean virtually nothing for Donald in Wonderland. Hillary Addendum: And a word about Hillary for all the on the fence-sitters or Trump-leaners who are obviously not racists: Yes, both she and the amazing effective and beneficial Clinton Foundation have taken full advantage of the fund-raising liberties that the truly deplorable Citizens United Supreme Court decision have allowed. That’s because she and Bill Clinton are supremely smart politicians (given their weaknesses and blind spots). And she needs to completely dis-associate herself from the foundation on Day 1 of a Clinton presidency. Nevertheless, the charges of corruption are based mainly on a matter of perception or as the media says these days, “optics.” Over these many years, nothing has been proven regarding Hillary pay-for-play influence, even though we can assume some of that big money has certainly influenced her point of view. But if such money had truly corrupted her, we would have evidence of it in her senatorial policy-making and Secretary of State decisions which, despite Benghazi’s tragedy and horrible optics and her e-mail-server misjudgement, mostly have been upstanding, moderately liberal. And, if she governs like she talks these days, she will be as progressive as she almost always has been on her own terms on social matters. I also believe she’s somewhat chastened on her hawkishness. Those who continually conflate her with her husband or even with Barack Obama’s administrative policies – as Secretary of State she had very little to do with domestic social policy – betray evidence of sexist bias, if not prejudice.No surprise, it’s baked into institutional American convention and the male American historical make-up. Every male, including self-proclaimed male feminists, must be vigilant to overcome this deep and subtle force from within (very similar to racial bias). That remains Hillary’s biggest challenge, I believe, at least as much as her own weaknesses. Back to Trump: So if Trump is given credit for a certain intelligence, in manipulating the public and the press, but beyond that really, what is there? Where’s the policy meat, beyond the thick layers of baloney? These questions prompted the image that I created recently. It is not a purely illustrative drawing, because I’ve spent my career as a print journalist although my background is as an artist. So — as Trump is mainly his rhetoric — it also incorporates quotes from him, and a couple of comments from the peanut gallery of Nature, which surely observes Trump with the great curiosity and perhaps to dread. He seems sanguine at best about global warming and the need to address it, like virtually all the Republican candidates. For those who can’t read the little flags in the big Trump stump – all Trump quotes or paraphrases – or the worm’s comment on the bottom, save as a word document or download the image and then magnify it. 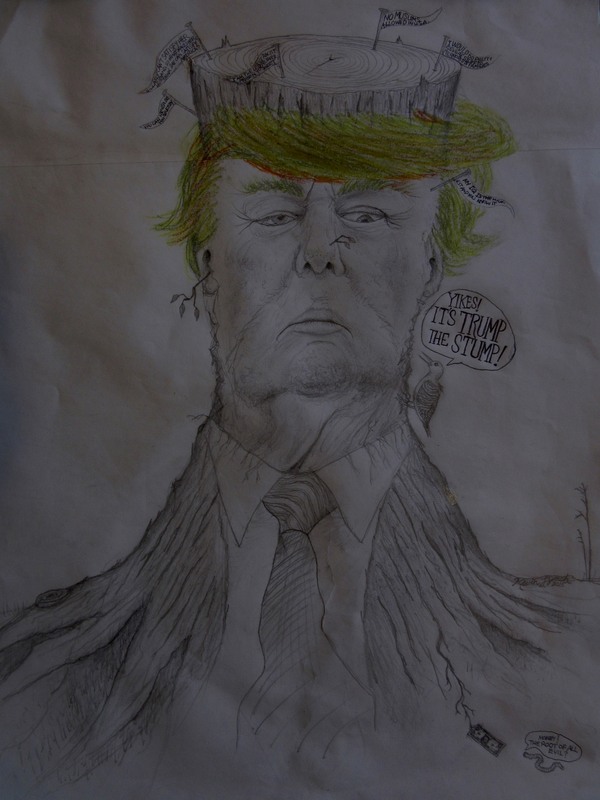 1 The original Trump drawing (above) is currently on display at The Jazz Gallery Center for the Arts, 932 E. Center St., Milwaukee. Thanks to Mark Lawson. 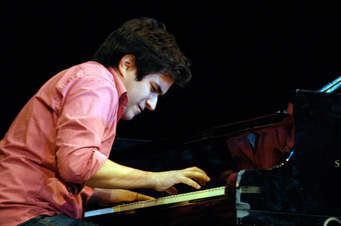 Cuban pianist Harold Lopez-Nussa. Courtesy juvenudrebelde.cu. Quick Currents: It’s time to wake up –- as I just did – to an extraordinary keyboard talent coming to Milwaukee. The Harold Lopez-Nussa Trio feels like a jolt of high-grade java from somewhere in ripe Southern climes. Is there Cuban coffee this powerful? You don’t really need that if you get a taste of Harold Lopez-Nussa. This promotional video shows his trio percolating to the very rim of your cup. It’s got some fun and silly surrealism going on. At one point, you see the pianist’s bodily detached right-hand. Baby boomers might respond to the ensuing keyboard flourish by saying “Thank You, Thing!” in remembrance of the mischievously deft right hand -– sans body – that worked as a servant for The Addams Family, in the original, wonderfully mordant TV show with Lurch, Uncle Fester and the gang. But this is serious musicianship and overflowing creativity as much as it is vibrant, quirky fun. And that’s superbly sustained and stoked by the pianist’s younger brother Ruy Adrian on drums and bass virtuoso Alune Wade. The brothers’ father is also an master drummer, and the family has been called a Cuban version of the Marsalis family of jazz. I’m not sure if that’s a shot of hype. But from what I’ve heard, it’s in the ballpark, and this music is a scorching line drive off the left field wall. There’s some very special bloodlines at work here, on their very own terms. And what I like is that, for all his clear virtuosity, the keyboardist (expect some electronics) is never really about showboating. The music takes you where it wants to, pretty damn far, and I don’t think you’ll regret where you end up. The trio will play at the Dirty Dog Jazz Café in Grosse Pointe Farms, MI on Friday and Saturday, Oct. 21 and 22, as part of a long American tour. Thanks to attorney-pianist Steve Tilton, whose law firm Tilton & Tilton is co-sponsoring this event with the Conservatory.